April is National Gardening Month...it&apos;s also a month with a lot of outdoor and indoor activities in the Peoria area! So - how do you keep track of it all? 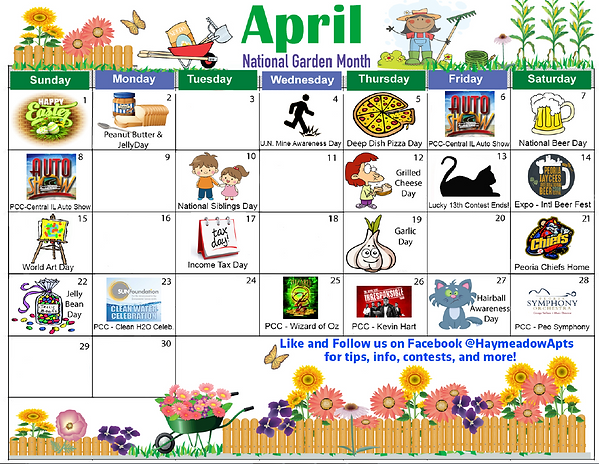 The Haymeadow Apts April Calendar of Events! Offbeat Holidays, Peoria Area Concerts, Games, and Events, and of course, Haymeadow Contests! You can find it all on our Calendar of Events HERE! Keep up to date on national holidays, Peoria area events, and off beat holidays with us! Quickly find what you are looking for. Use the search below.